I´ve been hosting weekly sessions for FXStreet en español over last few months in which I develop my views on diverse topics and analysis, as well. The previous posts (in Spanish) have been focused in developing and explaining some of the tools i regularly use, with analysis applied towards €uro, Crude Oil and Gold. I´ll do my best in to keep posting both in English and Spanish, although it will depend on the workload that I face on a daily basis. My goal is to reach a broader audience, so feel free to pass along, comment, suggest and participate. The note is partially translated. I´m hereto laying out the specific analysis for the €uro. From a fundamental perspective, it is important to take note of the current issues that dominate the current agenda: the question of the level of intervention of the FED, the to Taper or Not as a the theme that dominates the agenda of markets, the geopolitical situation in the Middle East, particularly in Egypt and Syria currently, aside of the summer “break” in Europe, at least temporarily, as we noted last week (see here the post, in Spanish) . These past few weeks have been characterized by very low volume, which we estimate will begin to change as the regular schedule of the markets resumes. The coming week brings a number of important economic events and announcements, among others, see the FOMC minutes (August 21), China HSBC Flash Manufacturing PMI (August 22) and the Fed’s symposium in Jackson Hole, Wyoming (August 22 and 24), plus the G20 ministers meeting (August 24), in anticipation of the G20 summit in Russia (Sept. 5-6), Germany GDP (Aug.23), among others. As an idea, we believe that the €uro deserves some “rest” after a complete retraction downward movement that began back in mid-June. This is why the hypothesis to find a new equilibrium zone appears as an interesting alternative. In that sense, it is important to note that this [1.34] is mayor level and, as we said above, we might possibly look into higher levels, maybe up to 1.3450, as an important area to define a new area of ​​balance, unless faced with increased buying pressure, hypotheses which we develop at the end of the note. For now, our dynamic indicators provided a signal into 1.3390s, giving way to a 60 pips retraction , around 1.3330, into Friday’s close. We remain attentive to 1.3320-1.3310, in the very short term. If these levels show no interetst from buyers, we will be looking at 1.3280-1.3268, and 1.3260-1.3230. 1.3220-1.3215, 1.3190 and 1.3172-1.3157, with emphasis on 1.3160​​. The commencement of the week found a brief support into 1.3280, then continue the retraction towards 1.3233, where buyers took control again, -at least temporarily-, which was validated by proprietary pressure indicators. 1.3311 action found increased selling pressure, which led to the €uro to seek new week lows around 1.3205, level that attracted the participation of buyers, and also which verified by our dynamical pressure algorithms . All levels were present in the note of August 8 (sent to the webinar attendees and posted on August 11 on the blog), with the exception of the latter, where we expected 1.3190 were tested. This point coincided with time in which we were presenting our webinar, where we emphasize that this type of response should be taken into account as well as the range 1.3271-1.3300, which, coupled with the significant participation of buyers identified through order flow, was important o be taken into account as s a sign of commitment from them. 1.3310-1.3300 was broken with significant intensity, exceeding our expectations in terms of levels, providing an indication of important to the defense of the 1.3200-1.3170 range. Our dynamical pressure algorithms validated buyers commitment into this these levels. as it was happening. The €uro closed the week finding equilibrium / balance at 1.3380-1.3310. What can we expect for the upcoming days? We recommend to read the following alongside the chart provided at the end of this post. It is important to note the (wide) area of balance between 1.3400-1.3160 ​​as the current play field, and furthering Constraining the range into the 1.3400-1.3300, as a closer approach. We Expect increased volatility next week after the t FOMC minutes of the on Wednesday 21, as well as Jackson Hole Symposium (Saturday 22-Sat 24) and PMI of France and Germany on Friday, 23. It is important to note the intensity of the price action, specifically into 1.3305 as an immediate level. We believe that a lack of commitment on the part of buyers at this level, could lead the €uro to revisit lower levels. Particularly, as a more immediate level, we will look at 1.3278, 1.3275-1.3230, 1.3264-1.3254 , to then look at the weekly support into 1.3220-1.3203. Following this line, we believe that a break of 1.3140-1.3120, could lead to the €uro to test 1.3100, which if does not attract buyers, would lead us to focus on the 1.3078-1.3060 as an important line of defense in the coming days . Failure to provide participation of buyers near these levels would put us more cautious and we will be looking into 1.3000-1.2970 and 1.2940. Provided this scenario, we would looking into the following levels, where we would expect some kind reaction in price. It is important to note that the defense of key levels by buyers on Thursday should be taken into account. As a principle, we continued our bullish view, provided that the area around 1.3300-1.3278 is defended by buyers. This leads to the development of our bullish scenario, which we construct below. Personally we believe that the whole market watching into 1.3400-1.3425, providing an important area for stop-loss orders to be located into this range, and it is important to remember that it is a key level that until now has had only been tested once. 1.35991.3612 and 1.3640-1.3680 as extended targets. Finally, into our order flow monitoring, we find a similar situation to what we noticed back in July 26 and August 8, with a significant increase in the levels of buyers over the last two weeks. 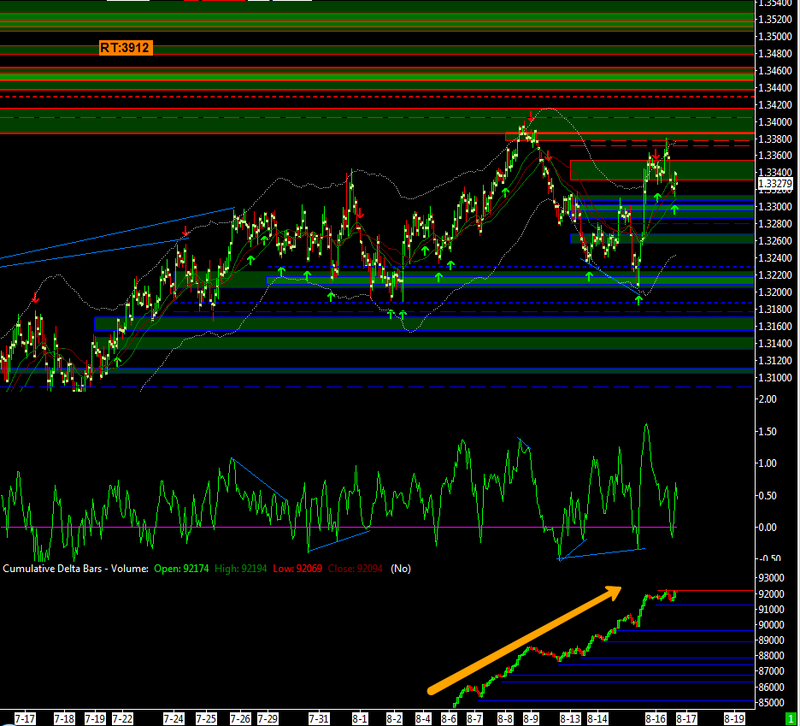 In that sense, we see increased participation from buyers over the last week -as compared to the previous one-. Only one level of sellers remains positioned into 1.3380, as of Friday August 16, according to our monitoring. Therefore, That is, we have seen an increase in terms of participation of buyers, even though the week ended with lower prices -as compared to the previous week. It is important to note this divergence between price and positioning. Alternatively, a renewed increase selling pressure could eventually, pressure the committed buyers. Depending on how significant this pressure will be under this scenario, it could eventually lead to a “run for the exits” of the buyers in the event they feel threatened. This would eventually act as a “fuel” for a significant drop when being cornered by the downward pressure. As usual, we will reviewing the dynamic positioning in the upcoming webinar in order to verify price action developent around the various alternatives laid out.